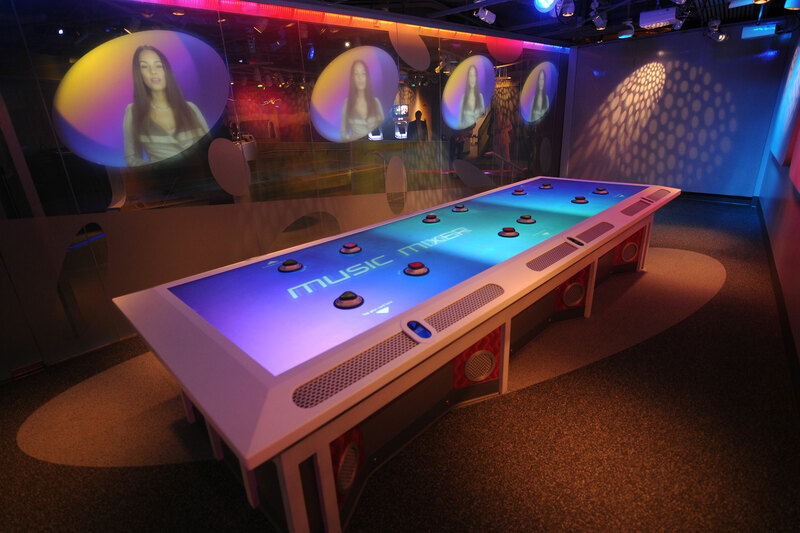 Music Mixer is a novel multi-player interactive exhibit at the Sony Wonder Technology Lab in New York City that unleashes the musical talents of every visitor. 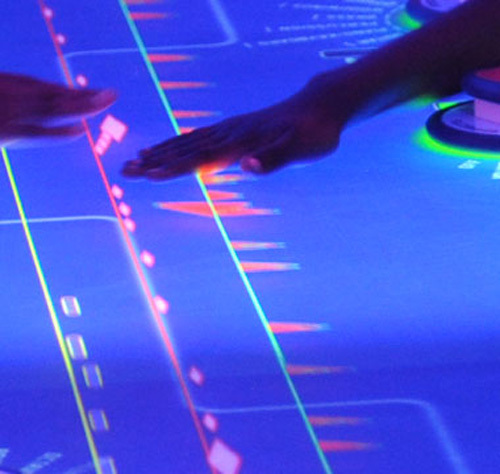 The glowing 12’ long table allows up to 6 visitors to collaborate on a “real-time remix” of popular songs by blending instrumental tracks and instrumental genres with different styles and musical effects. 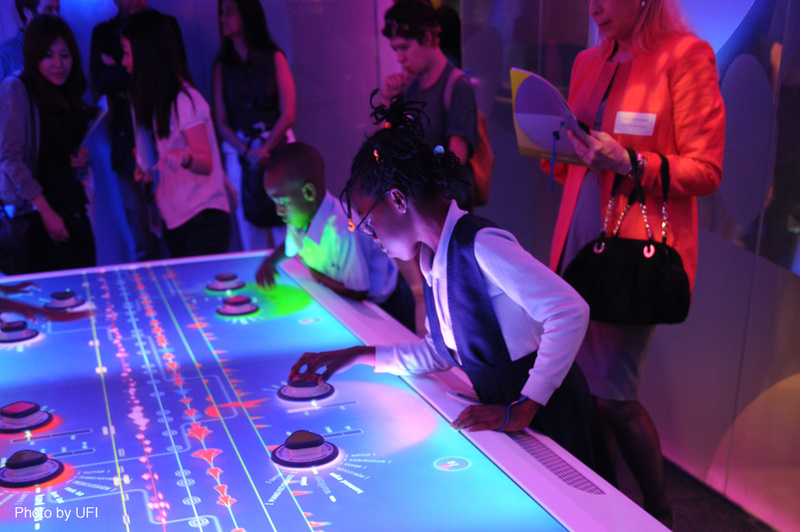 During the interactive, Grammy Award winner, Alicia Keys, invites visitors to create their own music and to collaboratively re-imagine a remix of her song, Empire State of Mind. Visitors produce musical notes using “audio blocks” (fiducial markers) with 18 instruments, in styles of Hip-Hop, Latin, World, and Jazz. 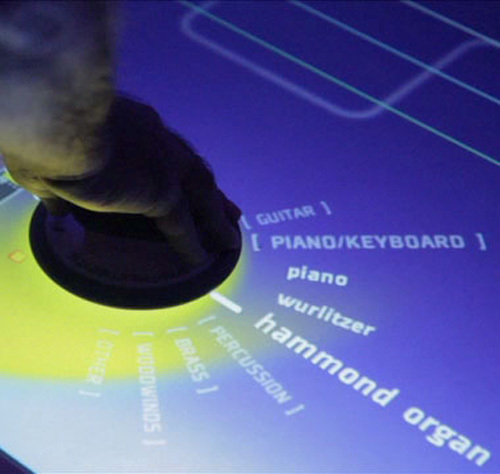 Each created note is represented as an animated shape, flowing in a real time musical stream across the table. We developed the table in OpenGL using a custom framework layered over openFrameworks. The hardware included three edge-blended projectors, a custom 12′ x 3′ Diffused Illumination multitouch table surface, and an RFID card reader log-in system. The software also communicated with a show controller to control lighting and a sign outside the room. The system was built using five computers – three were used to track and process touches and fiducial markers and broadcast that information over the network using TUIO, one computer ran the graphics and display application, and one machine ran a Max/MSP/Jitter application that communicated with Ableton Live in order to render the music and effects. Using the fiducial marker to select musical genres and alter the music in real-time by creating new instruments. Once an instrument was created it could be dragged into the center of the table in the user’s specified color and animate as it passed the creator’s workspace. © Unified Field Inc.
Alicia Keys attended a recording session to create content for the table. She introduced users to the experience while a line animated her voice in the background in real-time. © Unified Field Inc. The table during gameplay. Some instruments are being edited on on panels and there are multiple instruments running in the center of the table. © Unified Field Inc.